What is that FPGA-powered future going to look like and how are developers going to use it? FPGAs aren’t a new technology by any means; Traditionally, they have been reserved for specialized applications where the need for custom processing hardware that can be updated as very demanding algorithms evolve outweigh the complexity of programming the hardware. The array of gates that make up an FPGA can be programmed to run a specific algorithm, using the combination of logic gates (usually implemented as lookup tables), arithmetic units, digital signal processors (DSPs) to do multiplication, static RAM for temporarily storing the results of those computation and switching blocks that let you control the connections between the programmable blocks. Some FPGAs are essentially systems-on-a-chip (SoC), with CPUs, PCI Express and DMA connections and Ethernet controllers, turning the programmable array into a custom accelerator for the code running on the CPU. The combination means that FPGAs can offer massive parallelism targeted only for a specific algorithm, and at much lower power compared to a GPU. And unlike an application-specific integrated circuit (ASIC), they can be reprogrammed when you want to change that algorithm (that’s the field-programmable part). FPGAs have much more data parallelism than CPUs. The disadvantage is that the programming and reprogramming is done in complex, low-level hardware definition languages like Verilog. Rob Taylor, CEO of ReconfigureIO — a startup planning to offer hardware acceleration in the cloud by letting developers program FPGAs with Go — told the New Stack that there simply aren’t many hardware engineers who are familiar with these. Most FPGA development takes place at processor development companies. And the very different programming model, where you’re actually configuring the hardware, is challenging for developers used to higher level languages. “As a software engineer, you can start writing simple hardware but writing capable hardware takes several years of learning to get to right,” Taylor said. In rare cases, it’s possible to program an FPGA in a way that permanently damages it, although the toolchain that programs the hardware should provide warnings. The complexity of programming them is why the Amazon Web Services FPGA EC2 F1 instances that let you program Xilinx FPGAs are targeted at customers who already use FPGA appliances for their vertical workloads in genomics, analytics, cryptography or financial services and want to bring those workloads to the cloud. AWS actually provides a hardware development kit for FPGA configurations. Some of those appliance makers like Ryft will be providing APIs to integrate the AWS FPGA instances with their analytics platforms the way their FPGA appliances already do. The bandwidth between two VMs inside Azure, even with a 40 gigabit network adapter on each VM, is only around 4Gbps per second; with FPGA-accelerated networking, that goes up to 25Gbps. FPGA vendors are starting to offer higher level programming options, like C, C++ and OpenCL. AWS is relying on OpenCL FPGA programming to reach more developers in future, although this still requires a lot of expertise and isn’t necessarily a good match for the FPGA programming model. “It’s still a very esoteric type of development environment,” Russinovich noted; “but I think the trend is clear that things are going to get more and more accessible. I think you can imagine at some point — I’m talking a far future vision here — developers using different languages to write programs with tools that will take a look at your algorithm and determine, based on profiling or analysis, that this piece of your program is more efficient if we run it on FPGA and this one on GPU and this one on CPU, and developers just take advantage of the best capabilities the platform has to offer. Microsoft is taking a rather different approach. On Azure, you can actually use FPGA-powered services already; you just don’t know that you’re using FPGAs — in the same way that you don’t know you’re using flash SSDs when you use Cosmos DB or GPUs when you use Microsoft Cognitive Services. In fact, the whole Azure network relies on FPGA-powered software-defined networking. When Microsoft first started putting FPGAs into Azure, it was to scale low latency and high throughput to systems with very large amounts of data and very high traffic; the indexing servers for Bing. Initially, those FPGAs had their own network connections, but to simplify the network topology Microsoft switched to connecting them to the same NIC as the server they were in. 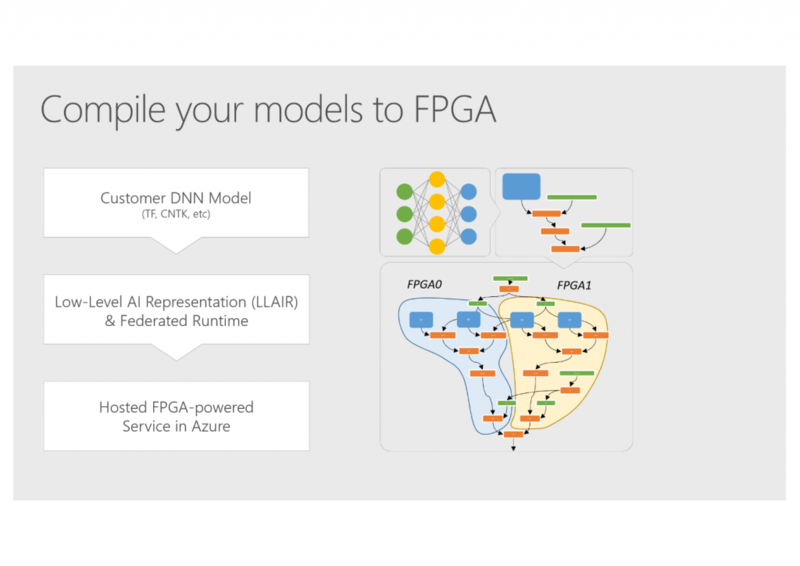 Once the FPGAs were connected directly to those network cards, they could also accelerate the software-defined networking that Azure uses for routing and load balancing. 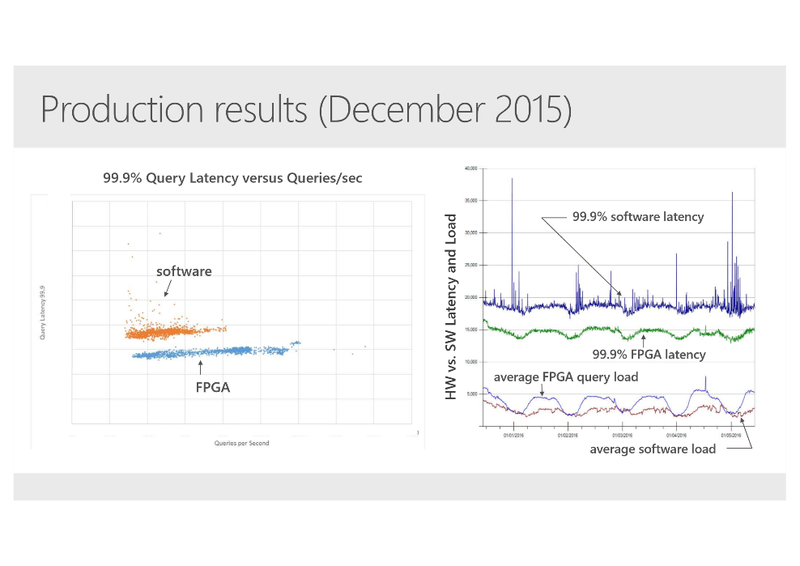 The impact of FPGAs on query latency for Bing; even at double the query load FPGA-accelerated ranking has lower latency than software-powered ranking at any load. Like custom silicon designed to go on a network card, these FPGA SmartNICs are more efficient than CPUs and use less power. But as Microsoft improves that software-defined networking stack to work with the 50GB and 100GB network adaptors that are coming soon, the FPGAs can be reprogrammed — which you couldn’t do with custom silicon. These SmartNICs already implement the flow tables that are the basis of Azure’s software-defined networking; in future, they might also implement Quality of Service or RDMA, and speed up storage by offloading cryptographic calculations and error checking. Azure Accelerated Networking has been available on the larger Azure VM sizes since last year, for both Windows Server and Ubuntu, although the service is still in preview and has what Russinovich called “extremely rare compatibility issues,” so you have to choose to use it. It also has some limitations, like needing separate Azure subscriptions if you want to use it for both Windows Server and Linux. The bandwidth between two VMs inside Azure, even with a 40-gigabit network adapter on each VM, is only around 4Gbps per second; with FPGA-accelerated networking, that goes up to 25Gbps, with five to ten times less latency (depending on your application). The impact of FPGA-accelerated SDN (credit Microsoft). The next step is building services for developers to use those FPGAs, even if it’s indirect. “There are multiple ways to make FPGAs available to developers, including us, just using them for infrastructure enhancements that accrue to every developer that uses our cloud, like SDN,” Russinovich explained. “We want to make deep neural network [DNN] and inference models available to developers, that are easy to deploy and easy to consume, and that’s running DNN on top of FPGA so they get the best performance. They would do their training for example on GPU, and bring us the models. The developers aren’t aware it’s FPGAs underneath; they just hand the DNN model to the platform and the platform executes it in the most efficient way possible. 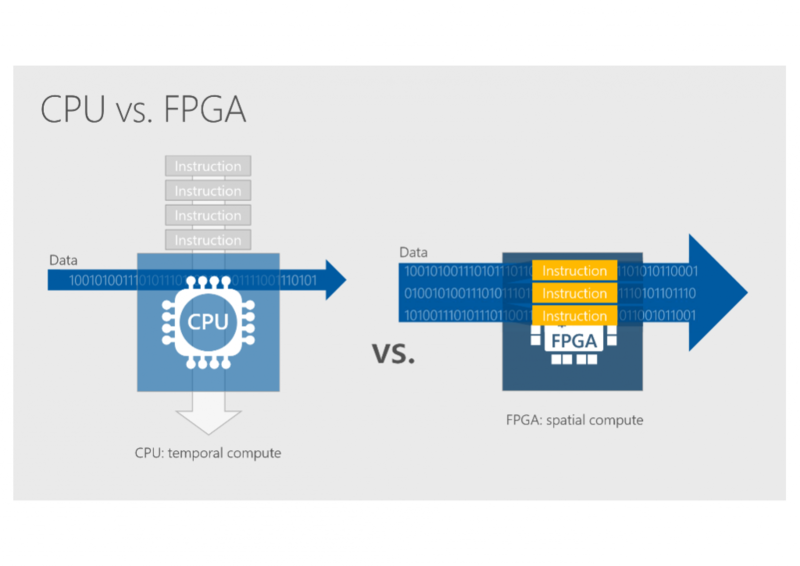 Different ways developers will use FPGAs in Azure (credit Microsoft). Russinovich demonstrated the advantage of that at Build, with what he called “tens to hundreds of tera-operations, so you can get really effective inference.” Running the same machine learning algorithm on 24 FPGAs rather than 24 CPUs, he showed a 150-200x improvement in latency and around 50 times the energy efficiency. Although each FPGA deployed in Azure is all on the same motherboard as a CPU and connected to them as a hardware accelerator, they’re also directly connected to the Azure network, so they can connect to other FPGAs with very low latency, rather than being slowed down by piping the data through the CPUs. That gives you much better utilization of the FPGAs, and the flexibility to still use them for acceleration as part of a distributed application that also runs on CPUs, or for experimenting with algorithms for acceleration that you’re still developing. “If you’re not sure of the optimal algorithms for say compression or encryption for the data you’re processing, or the data shape is going to be changing over time so you don’t want to take the risk of burning it to the silicon, you can experiment and be agile on FPGAs,” Russinovich told us. 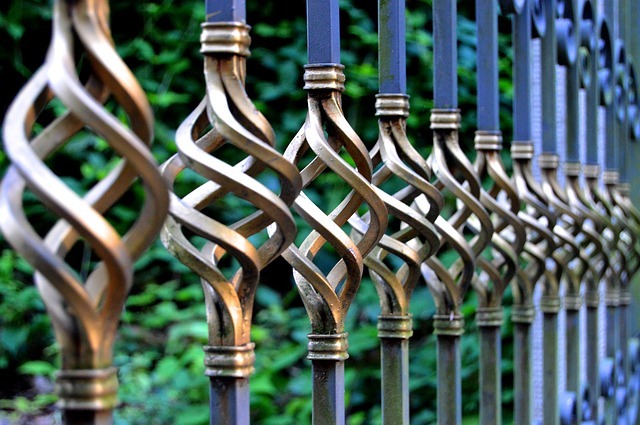 A management fabric co-ordinates those directly connected FPGAs into applications, so different layers of a DNN for a model that’s been pre-trained with TensorFlow or Microsoft Cognitive Toolkit (CNTK) could be on different FPGAs — giving you a way of distributing a very deep network across many devices, which avoids the scaling problems of many DNN frameworks. 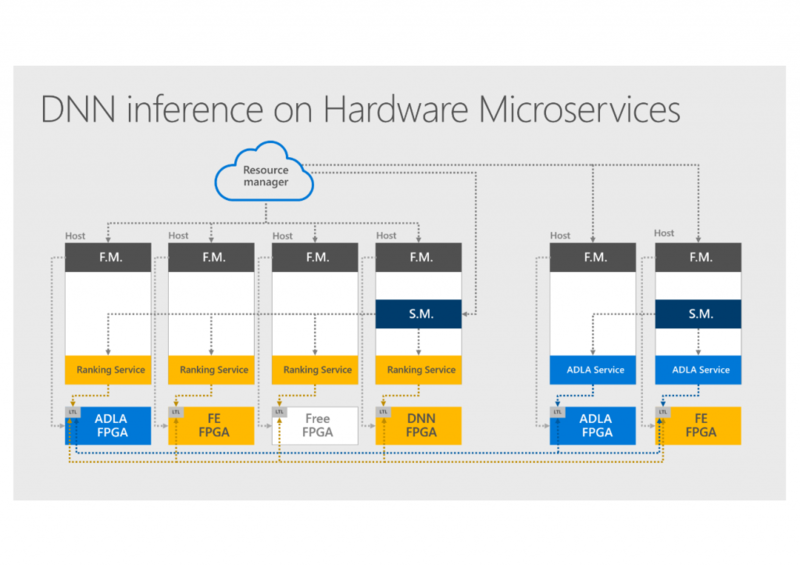 Distributing a DNN across the Azure FPGA hardware microservices fabric (credit Microsoft). Will developers end up writing their own applications to run on that hardware microservices reconfigurable compute layer, or will they use FPGAs broadly in any way? Russinovich predicted a mix of the ways developers will use FPGAs. “There will be developers that will directly take advantage of these things but I think many developers will end up indirectly taking advantage of this by leveraging libraries and frameworks that include those things for them, or using microservices models provided by ISVs or the open source community.” Further down the line, he suggested that could work much the same way containers do. That’s all some way off, Russinovich noted, but just as GPUs became a standard development tool for certain problems as Moore’s Law slowed down for CPUs, so might FPGAs — whether developers know they’re using them or not.